I’ve been to the desert on a horse named Raptor. The first time was in August of 2009. 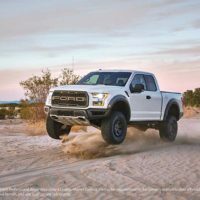 That was for the first appearance of the then all-new 2010 Raptor – a truck that, at the time, I described as “part pickup, part desert racer, and part Voodoo magic.” Now I’m back. 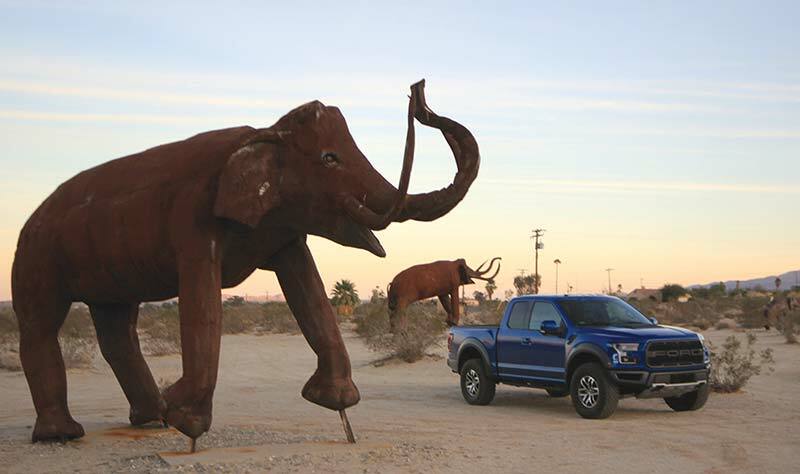 The desert is the same but the truck has changed. 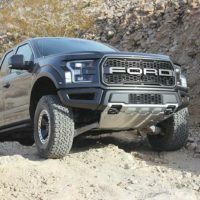 It’s now the second go-round for Raptor – a truck that has built a solid reputation and faithful following since its launch. Of course, the problem with following up a wildly successful product intro is how do you top it? 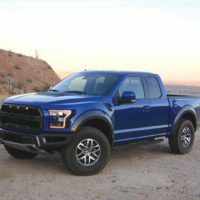 To start with, the introduction of the 2017 Ford Raptor completes an alignment of Ford’s truck cabs that will no doubt save them money and offer quicker updates to all the lines. 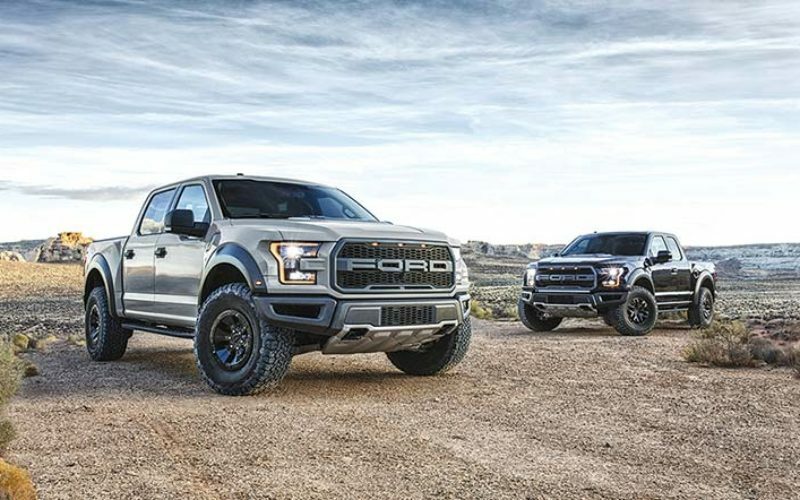 Super Duty, F-series and even Raptor now all share the same cabs. Chassis continue to vary but what’s planted on top is now built on one line and serves every model. 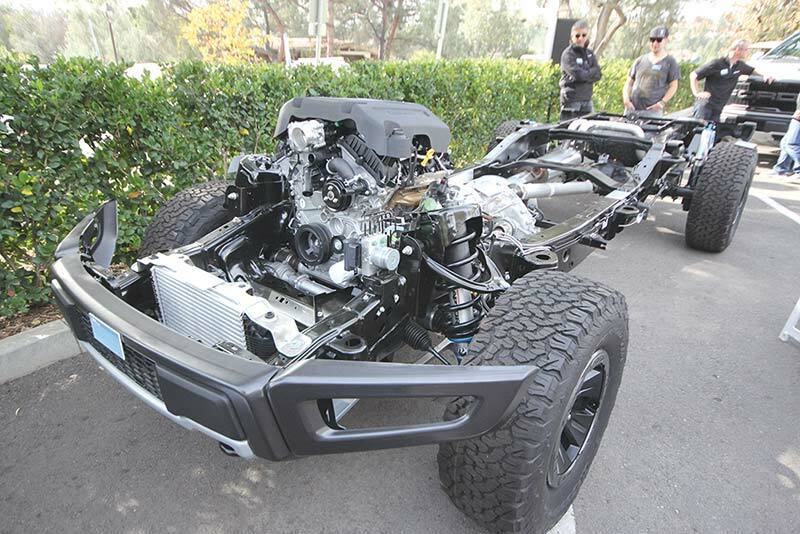 In the case of Raptor, adapting to this new aluminum cab also meant having to re-engineer many of the components and bits of running gear on the original. 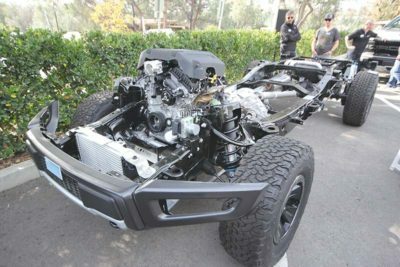 The good news is that Ford Performance didn’t just make the new cab fit the old chassis; while they were at it, they improved the whole truck. Circling the new Raptor, I can see that it has grown. 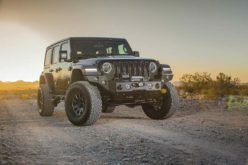 Two inches taller, and six inches wider, it hulks over its massive 37-inch BF Goodrich KO2 tires. 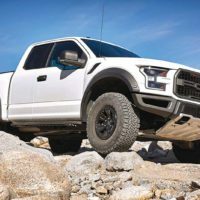 While, as I mentioned, all Ford truck cabs are now the same, the Raptor body panels from the A-pillar forward are unique, as are many of the design cues. Unique rounded wheel arches and lip mouldings shield the body from the spray coming off those specially designed tires, while a lowered beltline makes the truck look planted despite its height. 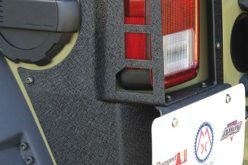 Practical features like shortened, pulled-back bumpers and full skidplates also create a unique look. 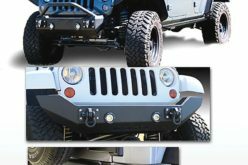 The mesh grille carries LED signature lights and blacked out headlamps. 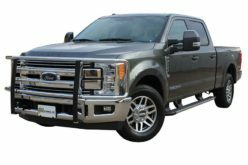 The hood sports functioning air intakes while the huge Ford logo front and back removes any doubt as to who this truck’s daddy is. 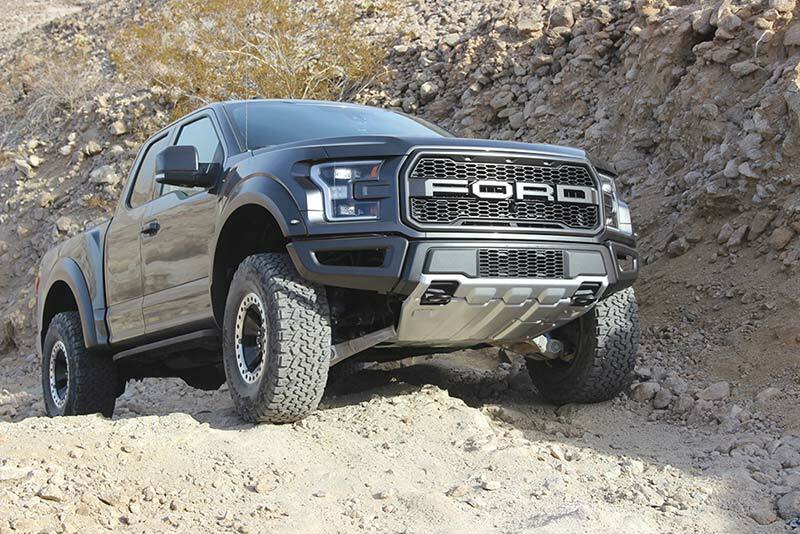 One of the much publicized advantages of the aluminum body is the weight reduction of 500 pounds that the engineers put to good use, as many of the Raptor’s parts are much heavier than those found on a F150. 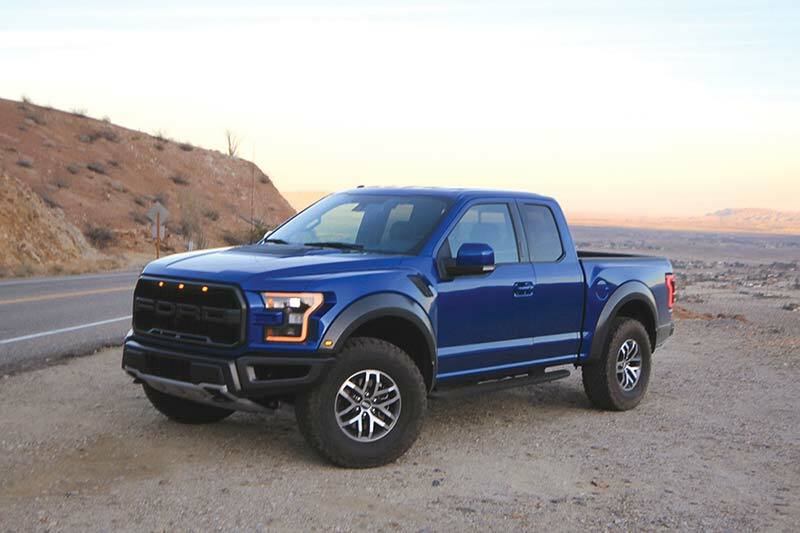 The Raptor interior carries most every convenience that Ford normally offers in its high-end trim packages. However, this does include special deep-bolstered seats that cushion and hold the body during off-road running. These seats carry embroidered Raptor logos and are available with colour-accented leather. The steering wheel, too, is leather-covered and features paddle shifters. A nice addition are the factory installed auxiliary switches in the overhead console. 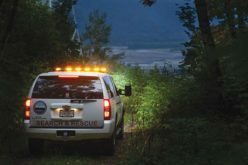 Easy to reach, they are perfect for wiring aftermarket additions like winches and extra lighting. To understand how far a vehicle has progressed, you have to know where it started. 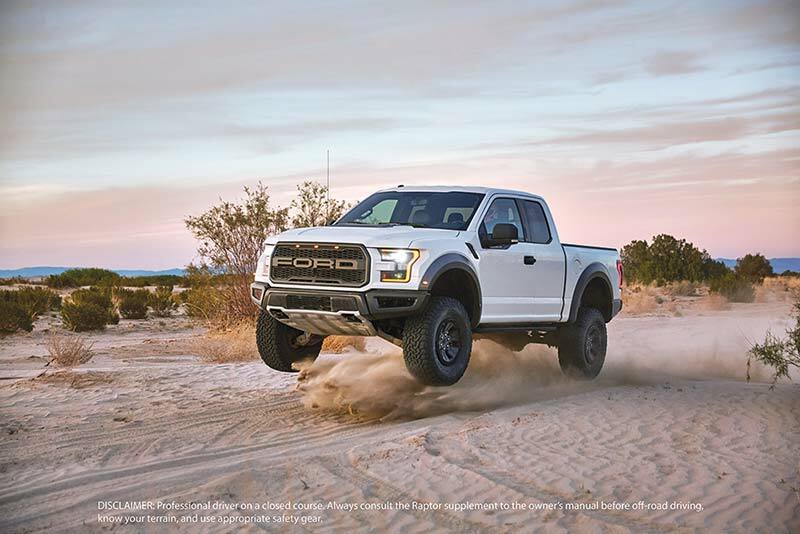 That first Raptor was powered by the 5.4-litre 3-valve V8 that made 320 hp and 390 lb-ft of torque. 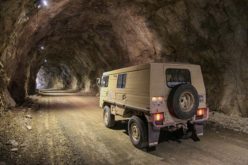 It was coupled to a six-speed transmission and its 4WD systems, while impressive, required the driver to change settings as needed. In other words, it needed an experienced off-roader to take full advantage of its prowess. Now, a scant seven years later, the tech in this truck is so advanced that any novice can get the most out of this truck using a Terrain Management System that not only switches between 2WD, 4WD HI/LO and AWD, its power output is computer calibrated and controlled, matching the needs of the ground it’s pounding. 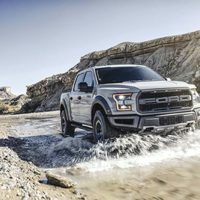 This time around, the power is being made by a new standard engine, the 3.5-litre V6 EcoBoost HO that pushes 450 hp and 510 lb-ft of torque through a ten-speed automatic transmission that is not sequential – it picks gears as needed. 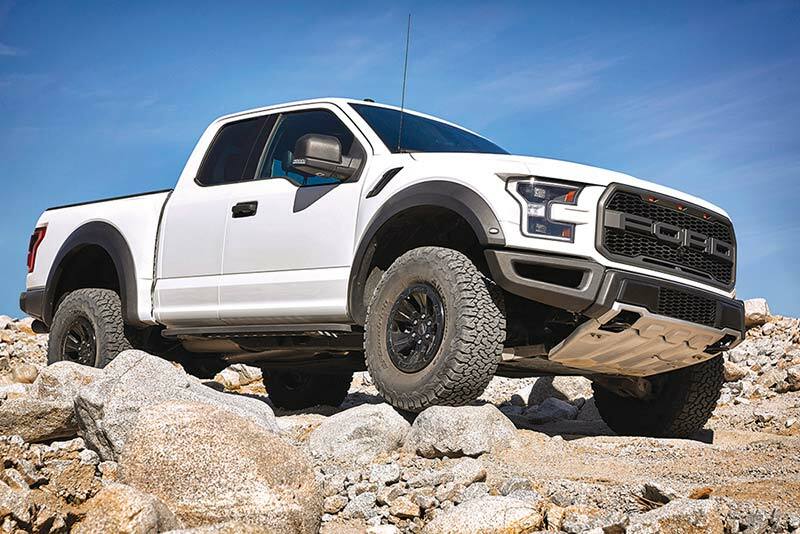 The Raptor’s suspension was always at the heart of its design – yet even that has been upgraded with more travel and ride height using new FOX shocks (now with a 3-inch-diameter barrel) with nine-stage bypass damping. Approach, departure and breakover angles have increased (30-degrees in the front and 22-degrees in the rear) and a true dual exhaust system is pushed high up into the body with exits at bumper height. A new 360-degree camera system has special applications for off-road running, like being able to see over sharp drops that the nose would otherwise obstruct. 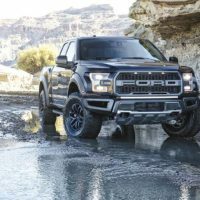 Every one of these things just makes the Raptor that much more capable off-road; however, never forget, this is a street-legal truck that you can easily use as a daily driver. 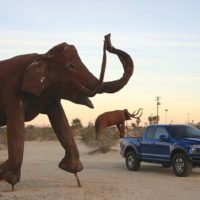 Driving the Raptor down to the desert from San Diego firstly reinforced the fact that this pickup does have a split personality – in a good way. 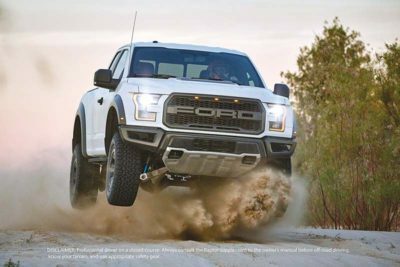 Even those big, soft shocks feature a stiffer upper valve that on the pavement holds the truck firmly and flat through the corners. It steers easily, is quiet (even with those gnarly tires) and when treated gently cruised in tenth gear achieving decent fuel economy. In other words, the on-road Raptor does not punish the owner despite its purpose-built off-road character. But then… set the terrain mode, snug your seatbelt, hammer the throttle and release the beast. Damn! Across the desert flats I quickly hit 130 km/h and held the speed even when the road started to rut and buck. The multi-stage shocks soak up the abuse using most of the long-travel suspension to keep the truck level and running straight. Terrain Management, in Baja mode for instance, spreads engine torque to each wheel based on slippage. 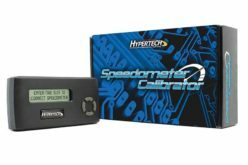 This constantly variable system is also augmented by the transmission that holds the gears below sixth while keeping rpms up, to maximize turbo boost. So, no lag when you punch it. Having the computer do all this means I could concentrate on driving, pushing my vision out to try and see the holes and ridges coming at me. Most of the time, I easily weaved through the obstacles, but sometimes I found myself unexpectedly airborne. Thankfully, Raptor lands as well as it flies. 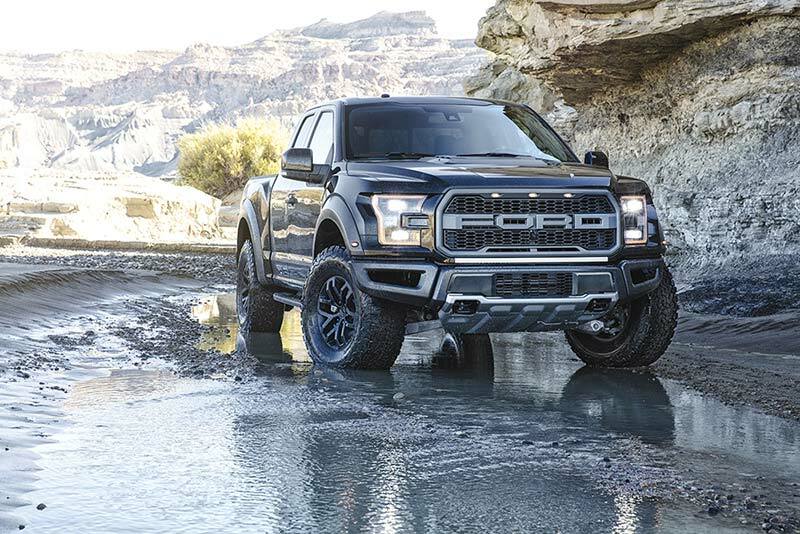 Canadian pricing for the new 2017 Raptor starts at $67,899 for the Super Cab and $69, 899 for the Super Crew. 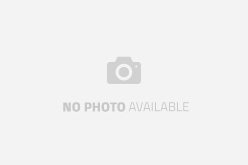 These prices include the mid-level trim package. For the luxury package upgrade, add another $7,900. Trucks are available to order now. 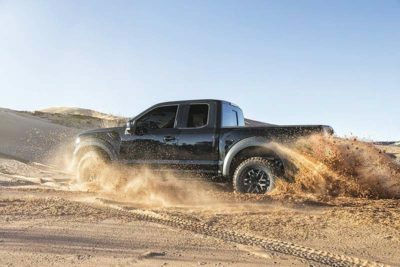 A lot of time is spent talking about Baja and desert racing when Raptor is discussed. I get it, that’s where it cut its teeth and the Detroit engineers who built it used those off-road racers as their inspiration. But, being a veteran of Ontario mud, ice and snow, I dare say that our Canadian climate poses as much or more of a challenge, one that this Ford should easily adjust to. 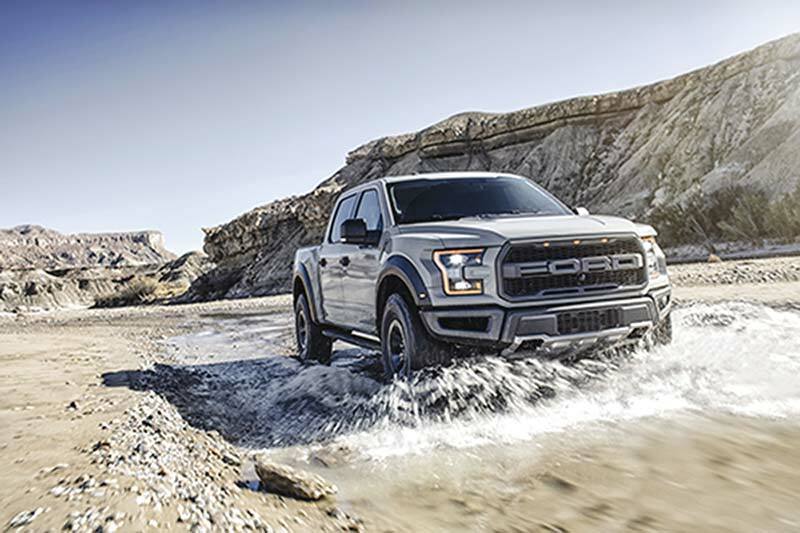 The Raptor is all about taming the most rugged of landscapes, and I am sure that it will take to the Great White North just as well as it has the California desert.